Finance Costs > How Much Does a Mausoleum Cost? A mausoleum is a structure erected as an interment space or burial chamber for a deceased individual. The building is constructed externally as a stand-alone structure and inside the mausoleum will be the tomb. The price will depend on if it’s indoors or outdoors, the location and the type. A single crypt or one entombment mausoleum, often found in a cemetery or church, can cost anywhere from $3,500 to $10,000. Single crypt mausoleums will generally have four-inch concealed walls and six-inch exposed floors. Double crypt mausoleums will also have four-inch concealed walls and six-inch exposed floors but will be side by side and can fit two entombments. This type of mausoleum can cost anywhere from $9,500 to $22,000. Quad crypt mausoleums have four entombments and can cost anywhere from $20,000 to $32,000. Garden crypts mausoleums will be outdoors and will have no building of any kind. This type can range anywhere from $3,000 to $5,900 for a single crypt, while a double can cost $4,800 to $9,500. Private mausoleums can cost anywhere from $20,000 to as much as $500,000 or more. These are private mausoleums that only family members can share. Ed Peck, a real estate developer in Florida, paid $400,000 for his lot at Daytona Memorial Park. 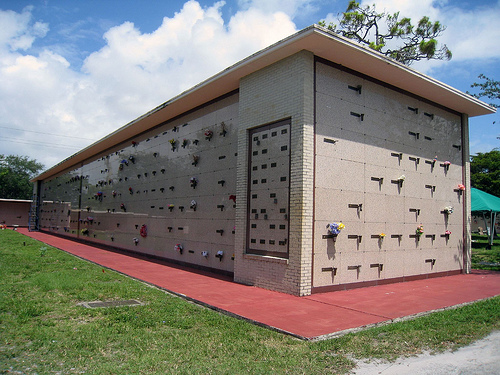 A cremation niche is also an option and is considered for those who want to be cremated. Similar to a mausoleum, there will be a wall with recessed compartments to place the urn in permanently. The purpose is to offer the family a place to visit their loved one’s remains. This type of setup can be available in a single, double or as a family space. This type of setup will depend on the setup, but a typical 9″ x 9″ x 9″ size cremation niche purchased before death can cost $800 to $3,000. Funeral Planning 101 says the average crypt can be about $4,000 and some can be as cheap as $2,000. Cemeteries will have three common mausoleum options: an indoor, outdoor and garden. An indoor mausoleum will be a shared structure built on the cemetery grounds and the crypts, usually about a hundred or more, will be inside. An outdoor mausoleum will have the crypts located outside and no structure will be included. Lastly, a garden mausoleum will be located outside in a garden-like setting with benches and waterfalls in a public setting; here, the crypts will also be outdoors. A private mausoleum will be a structure similar to an indoor one but won’t be shared with anyone else. As for crypt, the most common include a single, side-by-side, companion and family. Single crypts will be the most common and will include a single person in a casket. A side-by-side will be designed for two people and will be positioned next to each other horizontally. Depending on the setup, it may have a shared marker. A companion crypts will be designed for two people but will take the space of a single crypt. These caskets will be lined up from end to end and will share a single marker. Lastly, a family crypt, sometimes referred to as a Westminster, will accommodate as many people as you wish. This arrangement can be similar to an end-to-end setup where they are stacked on top of each other or each member can have their own marker. A mausoleum is designed to offer a neat and dry above-ground option. Once the body has been entombed, the vault will be sealed with a stone front, usually constructed of metal or granite, with the deceased’s name on the exterior, similar to a tombstone. These crypts, depending on the option you choose, can stack as high as eight to 10 tall. Depending on the mausoleum, it can either be private or public with limited viewing hours throughout the day. The lot where the mausoleum will be installed, if you choose a private one, will be an additional cost. Lots in the cemetery vary depending on the size of the lot and can start at $8,000. Niches are additional costs as this is where the body of the deceased will be placed before placing them inside the mausoleum. Niches can go anywhere from $4,500 to $7,000. Engraving the front of the mausoleum tomb can cost $200 to $1,000 depending on the style and quality. Upon death, additional fees will include a casket, embalming, as well as the services of a funeral. The average cost can be close to $15,000. Consider purchasing your own mausoleum and have it delivered to the cemetery directly. There are plenty of online retailers that provide this service. Talk with at least three cemeteries in your area. Most are going to be more than happy to discuss pricing as well as what they have to offer. By comparing these prices as well as talking with them, it will give you a better idea of what they are going to charge. If you want to have a private mausoleum, be sure to ask ahead of time to see if it’s allowed as many don’t allow it. Crypts will always cost more than a ground plot, but do keep in mind mausoleum crypts won’t require outer burial containers.